What we like most about this DVD is the instruction DVD is that it incorporates how to use a trainer kite to prepare for lessons. This is important and extremely helpful for anyone wanting to learn Kiteboarding, kitesurfing, snowkiting, or Kite Landboarding. 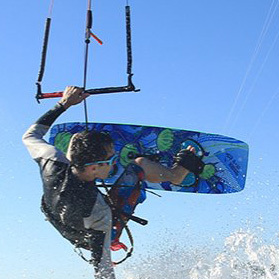 Chris Moore has been teaching kiteboarding since the sport of kiteboarding began to become popular in 2000. Chris has instructed many students and professional instructor and has served as the Head Examiner for PASA (Professional Air Sports Association). Chris brings not just experience but a practical, easy, and proven teaching methods. This DVD is chucked full of over 2.5 hrs of practical comprehensive instruction that will help you progress safely and quickly so that when you take lessons you will learn and advance much quicker. Learning how to kiteboard or snowkite will become much easier when learning with Chris through his instructional DVD. It will also save you money and time by providing a thorough overview of what you can learn and prepare for before taking lessons. This DVD is one of our first choices and is included with the sale of almost all of our trainer kites. One of your first goals when learning a power kiting sport is learning and mastering kite control and flying techniques. With over 20 yrs of professional kite flying experience Chris Moore brings wealth of knowledge to help you get started with the right information and instruction.